After a visit from a new friend, Lauren, we received a package. 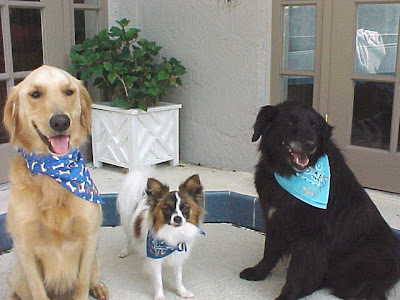 Much to our delight, Lauren had sent the pups new bandannas, with their names painted on each. The beautiful blue colors gave me an idea, as I opened the package while watching Tanner swim in the pool. All that blue just screamed out COOL, and I remembered seeing a cooling bandanna at a local pet store. Figuring that I could easily create this same product, I hadn't purchased one, but tucked the idea in the back of my brain for future use. So here goes. After raising 3 kids, I've had tons of injuries to ice. The top of my freezer has a good inventory of ice packs in various sizes, even a tiny one from one kids' wisdom teeth removal, that is perfect for Oliver. I rolled these ice packs into the neck area of the bandannas, before tying them onto the dogs. I wasn't entirely sure if the ice packs would stay put, but they did. A successful experiment! I did have to make one modification. Oliver's bandanna was the same size as the bigger dogs', so after I rolled the neckline of his even farther than the others, I tied knots at the spot where the tie and the triangle area of the bandanna meet. This shortened the ties so they did not drag on the ground, and probably helped keep the ice pack tucked inside also. It worked well. Xena seemed to maintain her pace better, with this cooling apparatus around her neck, and Tanner clearly enjoyed the sensation of the chilly addition. One thing didn't change though. 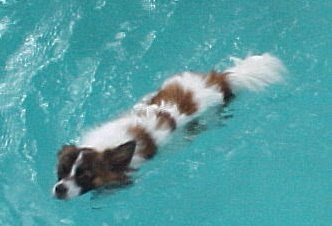 When we got home, Tanner and Oliver still went for their cooling swim. I suppose swimming is the still the best way to cool off after you work up a sweat. No bandannas or ice packs? You can order your pup a cooling bandanna right here. Actually, they are pretty cheap. I was pleased to see the prices. Have you tried any other ways of keeping your dog cool on long, hot walks? One of my neighbors hoses his chocolate lab, Roxie, down before a walk. This works great for her. 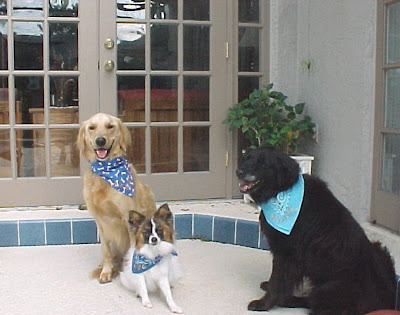 If you have pictures of YOUR dog wearing a cooling bandanna or other creation for this purpose, I'd love to share your best friend's photo on my blog. Send it to me at LetsAdoptaDogPark@gmail.com . Stay cool!